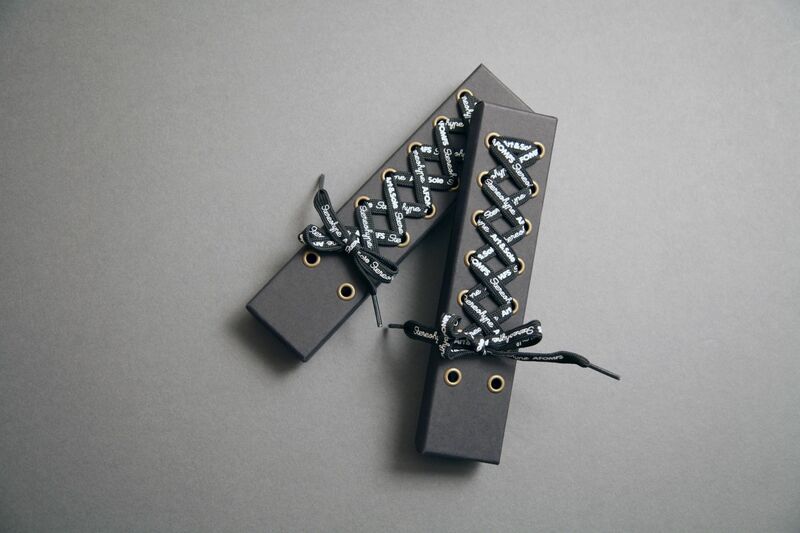 Two elegant limited edition gift boxes designed by FL@33 featuring a custom shoelace were released by Stereohype. 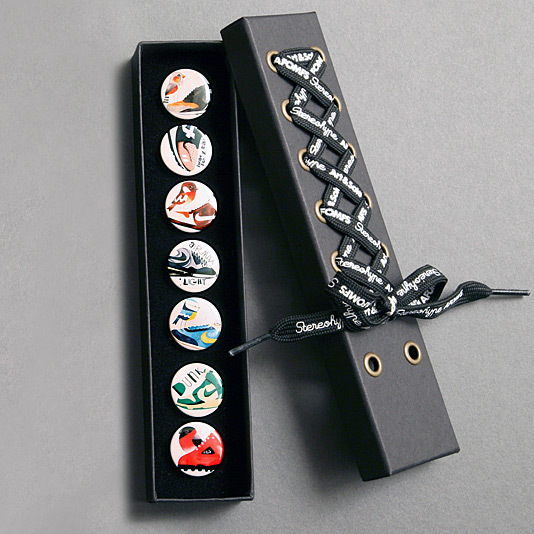 They contain 7 button badges each selected from the 48 AFOMFS (A Few of My Favourite Sneakers) badge series 1 – a collaboration between sneaker blog Art & Sole, Stereohype and FL@33. 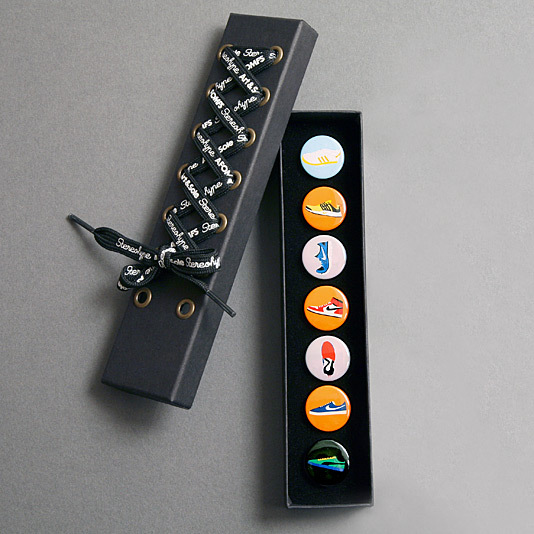 ___ Previous packaging solutions FL@33 developed for T-shirt and button badge label Stereohype include AFOMFS series shoelace packaging, themed sets of four for Habitat, Stereohype's gift box sets of seven and sets of 3 or 4 swing tag packs. ___ Stereohype's growing collection of button badges created by over 500 international graphic designers, illustrators, photographers and artists is currently featuring over 1,450 individual designs. They consist of B.I.O. (by invitation only) button badge series 1–18 contributions, winners of Stereohype's annual button badge design competition and additional series such as collaborative AFOMFS series and MICA series. 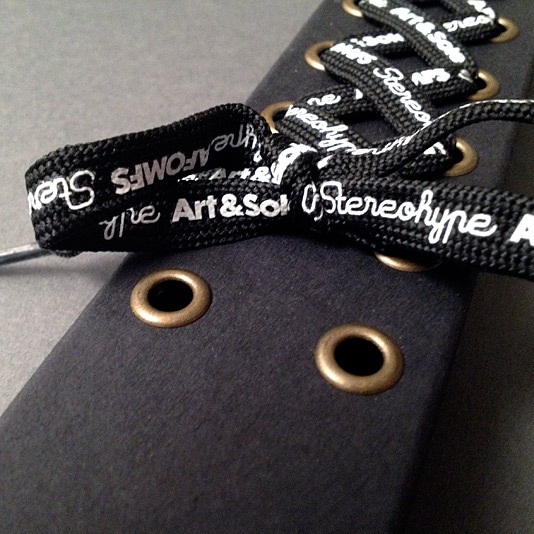 Available via stereohype.com and selected stockists. All seven taken from AFOMFS (A Few of My Favourite Sneakers) series 1. All seven taken from AFOMFS series 1.